The Meskwaki Probation Department provides guidance to Tribal Court probationers by encouraging them to be successful community members. Probationers are provided access to a variety of resources and services that not only address their offenses, but also promote healthy lifestyles and helps reconnect them with the community. We believe that offenders who maintain and/or build strong family relationships are less likely to re-offend. We believe that without targeted intervention, there is a higher risk that previous patterns of behaviors are likely to be repeated and/or passed on to the next generation. The Probation Department works as a resource to offenders by targeting educational and cultural opportunities to reduce the chances of re-offending by promoting lifelong learning, employment, counseling, mentoring, and social inclusion practices. You’ll find docent reports, forms, pay tickets and more. For more information, contact Misty Jefferson at (641) 484.9300. Diabetes Program Cooking Demo has been rescheduled to Thursday, April 25th. It will start at 12:00 pm and be in the Tribal Center Kitchen. 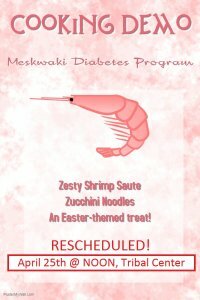 Menu: Zesty Shrimp Saute, Zucchini Noodles and an Easter-themed treat!